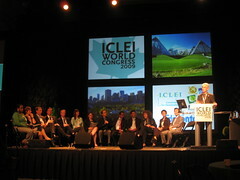 The ICLEI World Congress 2009 started here in Edmonton today. 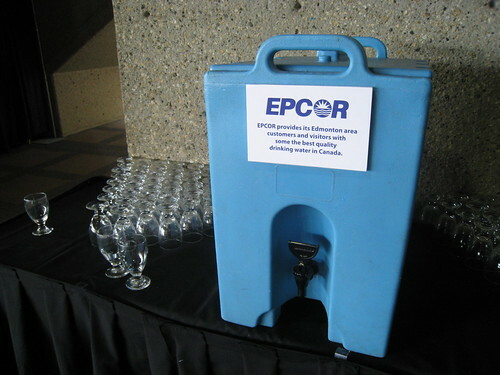 The conference is taking place at the Shaw Conference Centre through Thursday. Over 600 delegates from around the world will be discussing a range of topics related to sustainability and municipalities. 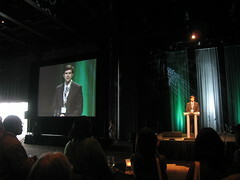 A series of opening keynotes this afternoon set the tone for the event. Mayor Stephen Mandel, ICLEI President Stephen Cadman, Minister of Municipal Affairs Ray Danyluk, Chairperson of the World Mayors Council on Climate Change Bärbel Dieckmann, and Leader of The Economics of Ecosytems & Biodiversity (TEEB) Pavan Sukhdev all shared remarks this afternoon. I thought the most passionate speaker was David Cadman, recently elected to his third term on the ICLEI Executive, and his second consecutive term as President. He discussed a range of issues, but focused on the need to transform the way we live. In particular, he stressed that water is going to become a larger and larger problem. 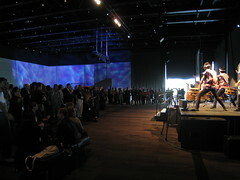 Also during the opening plenary was a video to “pass the torch” from Cape Town, which hosted the congress in 2006, to Edmonton. This wouldn’t be noteworthy except for the fact that the video included B-roll footage of Calgary, not Edmonton! The Calgary Tower was clearly visible in a couple of the shots. I’m sure most in the audience didn’t notice, however. About 54% of ICLEI members are from North America, but 39% of the populations represented by ICLEI live in Asia. Europe is more balanced. ICLEI’s USA office is moving from Oakland to Washington, DC. One wonders why it wasn’t there in the first place. There are 27 ICLEI members in Canada. Our country’s office was created in 2003, has 3.5 staff, 5-10 projects per year, and a budget of roughly $300,000 USD. Global budgets for ICLEI are expected to increase 22% this year compared to last. Revenue sources include membership, fees for service, host contributions, and by far the largest segment, grants. Municipalities around the world are targeting a 30% reduction in emissions by 2020, and an 80% reduction by 2050. 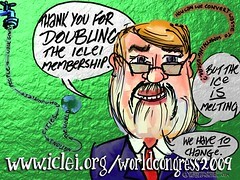 ICLEI by the numbers in 2009: 223 staff, 1078 members, 102 projects, and a budget of $16.8 million USD. I learned a lot about ICLEI today, and I absolutely see the need for such an organization. An increasing portion of the world’s population lives in cities, yet cities are often absent from landmark discussions related to climate change and sustainability. 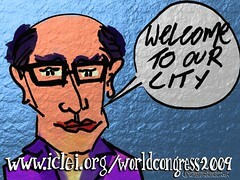 ICLEI gives municipalities a voice and a mechanism for pressuring their provincial and national governments to do more. Membership in the United States has increased dramatically in recent years, something ICLEI attributes to the Bush administration which largely ignored municipalities. Following this afternoon’s session was an opening night reception in Hall D. Councillor Don Iveson hosted the event which featured entertainment from Kita No Taiko and others. I had the opportunity to chat with a number of people, including Roy Blumenthal, a visual facilitator who was drawing caricatures of all the speakers on his Tablet PC. Such beautiful work! All attendees can ride Edmonton Transit for free simply by showing their conference badge. Recycling facilities will be available at all locations visited by participants. There are around 100 delegates who don’t speak English. There were headphones on hand today providing translations in English, French, Spanish, and Korean. 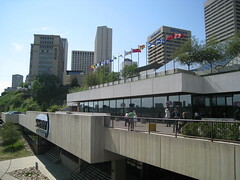 The City of Edmonton has turned on Wireless Edmonton service throughout the Shaw Conference Centre, providing attendees with free wi-fi. There are guided walks of the river valley for attendees starting each morning at 7am. I won’t be attending all of the sessions this week, but I’ll tweet and blog what I can. Dave Cournoyer also wrote about today, and will be covering ICLEI all week. Search Twitter for #ICLEI for updates. You can see the rest of my photos here. For a list of events taking place during and after ICLEI, click here.